MOVILLE was the recent setting for a discussion on the All Ireland Pollinator Plan and the vital importance of bees to the world's food supply. The meeting heard a number of startling facts including that "100 crops provide 90% of the world's food (and) 71% are pollinated by bees". Sadly, a third of Ireland's 98 bee species are threatened with extinction. A decline in our beautiful wildflowers including the fuschia and foxglove is "subjecting our pollinators to starvation", according to statistics from the All Ireland Pollinator Plan 2015 - 2020. The talk at St Eugene's Hall in Moville was delivered last Friday by nature conservation group Wild Inishowen following an invitation by members of the community in Moville and Greencastle. Wild Inishowen is bringing details of the Pollinator Plan to community groups and children throughout the peninsula. 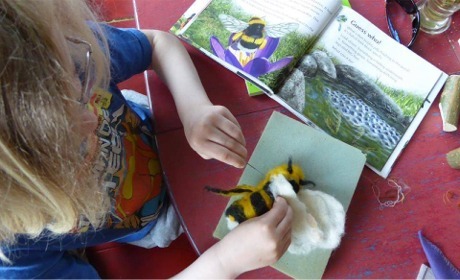 Bee-lieve: A local youngster crafts a beautiful bumblebee ahead of the Moville event. The Moville hosts say they are "keen to create a space for the exchange of information, ideas and solutions to help stop the destruction of pollinators". Bees, they say, are "so vital for biodiversity, food production and the general well-being of the planet". The Pollinator Plan is co-ordinated by the National Biodiversty Centre and makes Ireland one of the first countries in Europe with a strategy to address pollinator decline. The plan is a response to the widespread destruction of pollinators and the impact this has for the planet and its people. "Pollinators tend to be tiny creatures, yet the impact of their work is absolutely huge. Maybe we should be inspired by this fact to realise that no matter who we are, and whatever our circumstances, we can all of us do something to bring about positive change," said one of the Moville talk organisers. View the All Ireland Pollinator Plan .